The deal that vanquished the final opponents standing in her way came with a hefty price tag: an agreement from Pelosi that she would not serve more than four more years as speaker. Ultimately, of the 430 votes cast, Pelosi received 220 votes, 17 more on the floor than the 203 who supported her during the Democratic Caucus vote Nov. 28. One notable vote for Pelosi came from Oklahoma Democrat Kendra Horn, whose unexpected victory came in a solidly Republican district. Most of Pelosi’s opponents were freshmen who made campaign promises not to support her for speaker. Other freshmen who made similar vows or called for new leadership ultimately backed Pelosi — votes Republicans will undoubtedly attack them for if they run for re-election. No Republicans voted for Pelosi. As is customary, members of the minority party mostly voted for their leader, Kevin McCarthy, although there were a few exceptions. Justin Amash of Michigan, for instance, voted for Kentucky’s Thomas Massie, while Massie, Reps. Andy Biggs and Paul Gosar of Arizona, Scott Perry of Pennsylvania and Jody B. Hice of Georgia voted for Freedom Caucus co-founder Jim Jordan of Ohio. Despite the small contingent of Democrats who opposed her, Pelosi returns to the speaker’s office with a great deal of power. She retains the support of the vast majority of her caucus and is strongly backed by outside Democratic groups. Perhaps as a sign of that, Randi Weingarten, president of the American Federation of Teachers and Stephanie Shriock and Ellen Malcolm, leaders of EMILY’s List, were her guests in the gallery. 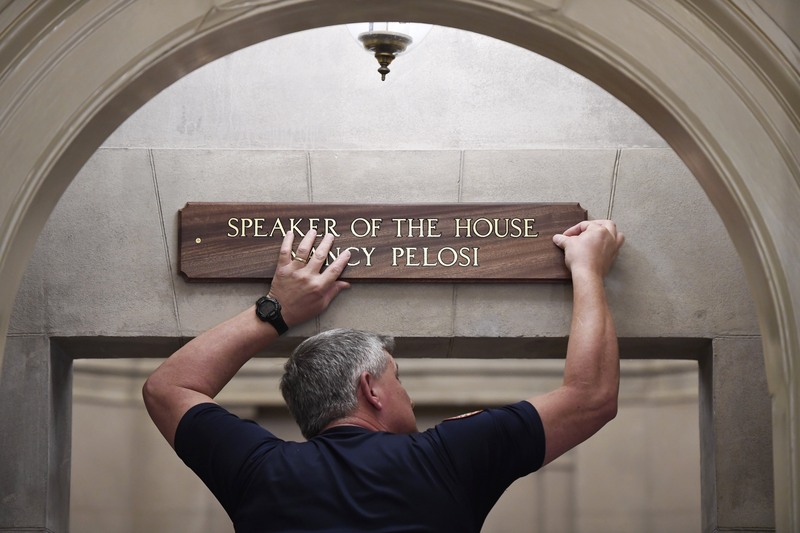 Pelosi became the first woman elected speaker in 2007, and on Thursday she became the first speaker to reclaim the gavel after a hiatus in the minority since Sam Rayburn did so in 1955. As speaker, Pelosi is second in line to the presidency, behind Vice President Mike Pence. Jason Crow of Colorado: Sen. Tammy Duckworth, D-Ill.
Joe Cunningham of South Carolina. : Rep. Cheri Bustos, D-Ill.
Jared Golden of Maine: Bustos. Ron Kind of Wisconsin: Rep. John Lewis, D-Ga.
Conor Lamb of Pennsylvania: Rep. Joe Kennedy III, D-Mass. Ben McAdams of Utah: Rep. Stephanie Murphy, D-Fl. Kathleen Rice of New York: Stacey Abrams. Max Rose of New York: Duckworth. Kurt Schrader of Oregon: Rep. Marcia Fudge, D-Ohio. Mikie Sherrill of New Jersey: Bustos. Elissa Slotkin of Michigan: Present. Abigail Spanberger of Virginia: Bustos. Jeff Van Drew of New Jersey: Present.